The Forum of International Respiratory Societies (FIRS) warns that air pollution exposure affects many organs beyond the lungs, posing a great risk to health. 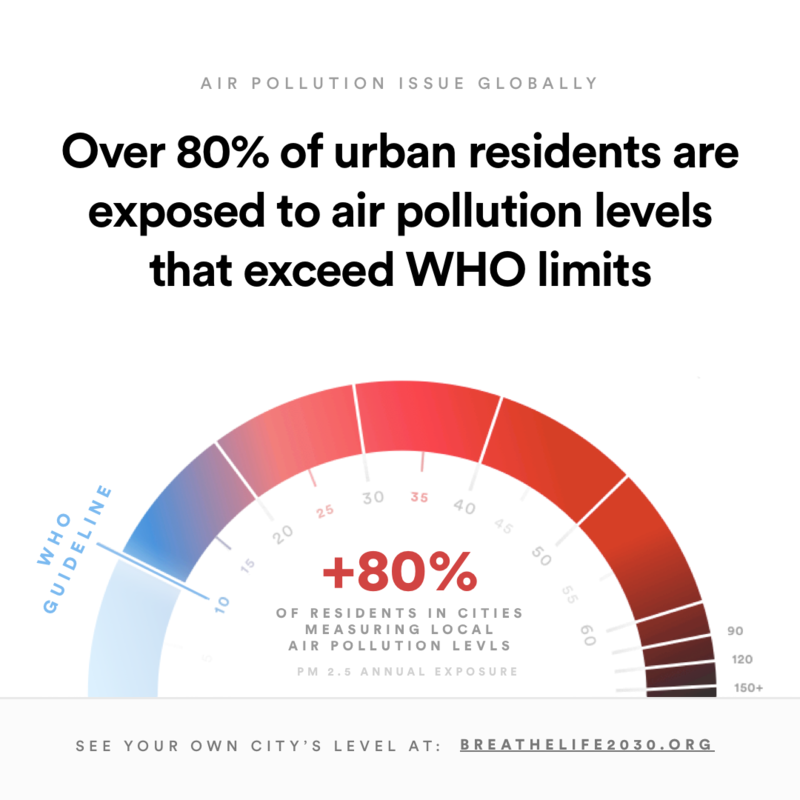 Outdoor fine particulate matter exposure is the fifth leading risk factor for death in the world, accounting for 4.2 million deaths and 103 million disability-adjusted life years lost according to the Global Burden of Disease Report. FIRS’ Environmental Committee published two articles in the journal CHEST on the effects of air pollution on health and evidence for its association with many diseases. The Forum of International Respiratory Societies (FIRS) would like to thank all organisations who have pledged to support World Lung Day 2019. World Lung Day falls on 25th September and is a day to rally advocacy for respiratory health and air quality globally. You can see the full list of organisations supporting World Lung Day 2019 below. World TB Day, falls on 24 March each year, a day designed to build public awareness that tuberculosis (TB) today remains an epidemic in much of the world. 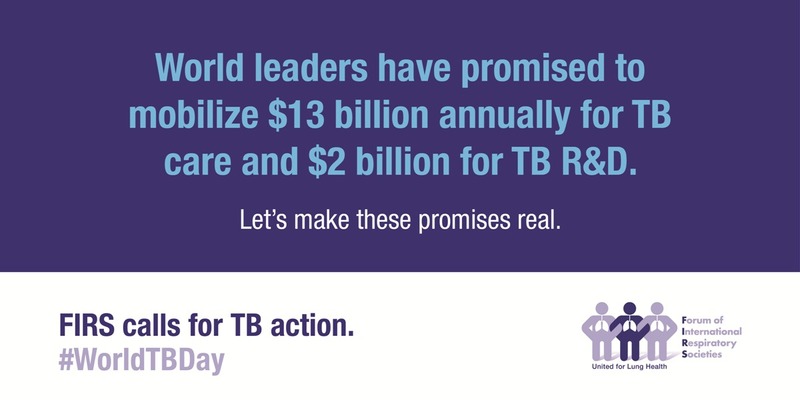 TB is preventable and curable, yet it remains the world’s most common infectious disease killer. The World Health Organization (WHO) estimates that 10 million people fell ill from TB in 2017 and 1.6 million people died. Only 64 percent of the estimated 10 million global cases of TB were actually diagnosed and notified. Tuberculosis (TB) is the world’s leading infectious disease and it accounts for one in three deaths from HIV/AIDS, according to the World Health Organization’s (WHO) 2018 report on TB. 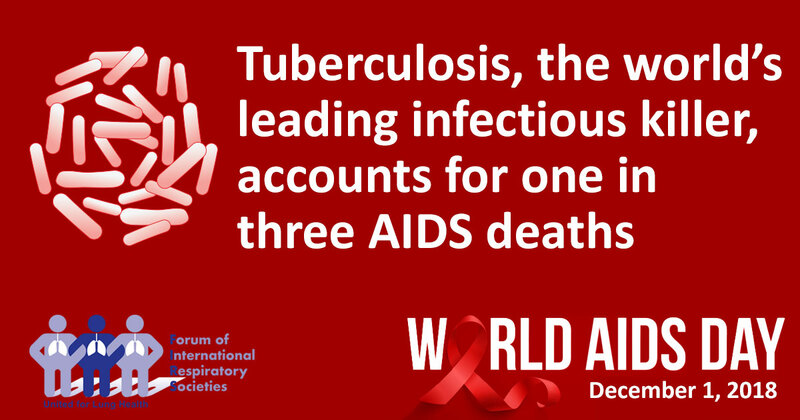 This is why on World AIDS Day the Forum of International Respiratory Societies (FIRS), calls on governments, health advocates and non-government organisations to strengthen their response to AIDS and TB. An article published in the European Respiratory Journal found that a higher proportion of patients diagnosed with hypersensitivity pneumonitis (HP) lived in cities with higher levels of air pollutants. . 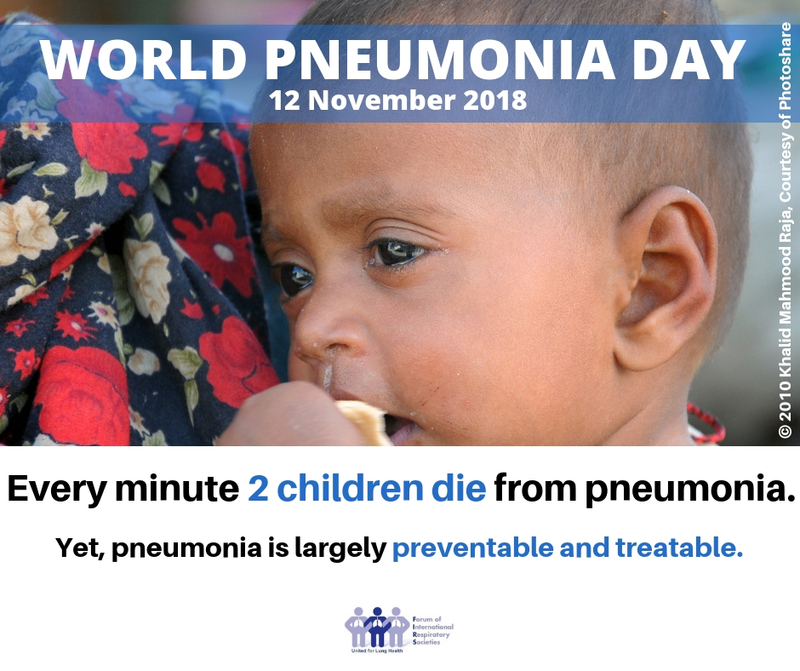 Pneumonia is one of the most preventable and treatable illnesses in global health, yet every minute two children die from this illness, primarily because they are denied the benefits of prevention, accurate diagnosis and treatment. 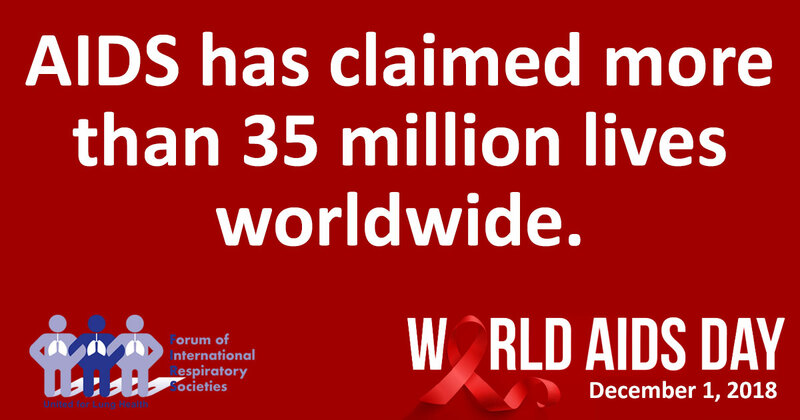 World AIDS Day, 1 December, is an international day dedicated to raising awareness of the AIDS pandemic. Shortly after AIDS emerged, it fuelled a global resurgence of Tuberculosis (TB) that continues in many low and middle-income countries. TB is the world’s leading infectious disease and it accounts for one in three deaths from HIV/AIDS, according to the World Health Organization’s (WHO) 2018 report on TB. The Forum of International Respiratory Societies (FIRS) is attending the first ever global event to focus on both air pollution and health. The Global Conference on Air Pollution and Health takes place from 30 October to 1 November in Geneva bringing together global, national and local partners to share knowledge and mobilise action for cleaner air and better health globally. Chronic obstructive pulmonary disease (COPD) is a preventable and treatable disease that causes breathlessness, chronic sputum production and cough, there are 251 million current cases of COPD in the world. COPD is currently the 3rd leading cause of death globally and is highly prevalent in low resource countries. World COPD Day is an annual global initiative run by the Global Initiative for Chronic Obstructive Lung Disease (GOLD), who are members of the Forum of International Respiratory Societies (FIRS). World Pneumonia Day on 12 November brings people from all over the world together, uniting to demand that something be done to fight pneumonia. Today on World Lung Day, people affected by and working against respiratory disease, come together for lung health action. Too often we take breathing for granted. World Lung Day, on 25th September, is an opportunity for us all to unite and advocate for better lung health globally. Organisations and individuals from around the world have joined the campaign, to shine a spotlight on the alarming statistics, and to hold their own lung health events. Two historic health meetings take place later this week in New York: 26 September, the United Nations High-Level Meeting on Tuberculosis and 27 September, the United Nations High-Level Meeting on Non-Communicable Diseases. More than 50 heads of state will attend and speak at the meetings destined to scale up the response to these important health problems. The Forum of International Respiratory Societies (FIRS) warns that air pollution exposure may stunt lung function growth of children into adolescence. An article published by scientists at Utrecht University in the European Respiratory Journal found that Dutch children, exposed to air near their homes containing high concentrations of nitrogen dioxide, soot, and particulate matter from preschool age onwards, had lower airway growth at 16 years of age . The Global Asthma Report 2018, launched by the Global Asthma Network on 31 August 2018, finds that a large proportion of people in the world with asthma are not getting adequate treatment. “Millions of people suffer from asthma because they do not get access to the medicines that lessen their breathing difficulties,” says Professor Asher, Chair of the Global Asthma Network. The Forum of International Respiratory Societies (FIRS) is concerned with the findings of a new study highlighting an increased risk of ischemic heart disease (IHD) mortality in relation to diesel and respirable dust exposure. The study published in the prestigious American Journal of Epidemiology by a group of leading scientists involved more than 10,000 US miners. It found that the miners exposed occupationally to diesel exhaust and respirable dust, had an increased risk of IHD mortality . FIRS would like to thank all organisations who have pledged to support World Lung Day 2018. World Lung Day falls on 25th September and is a day to rally advocacy for respiratory health and air quality globally. You can see the full list of organisations supporting World Lung Day 2018 below. Lung cancer continues to be one of the most common cancers worldwide, claiming more lives yearly than breast, colon, and prostate cancers combined. World Lung Cancer Day is a great opportunity for us all to raise awareness about lung cancer , highlighting the key risk factors as well as screening and treatment options. This World Lung Cancer Day the Forum of International Respiratory Societies (FIRS) commemorate, celebrate and support those impacted by lung cancer.